With all of my family living in the U.S. (for fun I always tell people Glen found me in a catalogue and imported me - LOL) and Glen's family woefully lacking women (neither brother married or had children), holiday dinners are definitely at my house. Thanksgiving I do have a little more time as the season is not fully upon us. I usually bake a ham which is easy and add a few more complicated dishes for fun. Christmas is, however, totally crazy! Over the years I have honed it down to a science with at least two dishes plus stuffing being made the day before. The house is also cleaned and the table set the night before. Christmas morning I just stuff the bird, pop it in the oven and baste it occasionally. While the last 30 minutes before the dinner hits the table is always busy, I get to spend most of the time enjoying the company and working on the requisite jigsaw puzzle placed strategically on the coffee table. I have several dishes in my arsenal that are easy to do the day before. Three only need heating in the microwave and I think taste great (a very subjective thing as not everyone likes everything) and one is prepped the day before and baked. I am not a fan of all the vegetable and yam recipes that have sweet sauces, etc., the normal holiday fare. The first recipes shared below fit the bill for me - you make them the day before and then reheat in the microwave (or oven if you have room), they are savoury not sweet and simple to put together. The fourth can be fully prepped the day before then just assembled and thrown in the oven that day. The only consideration is oven space. If you have just one oven filled with a huge turkey, you could be in trouble as you have to bake the green bean casserole at the last minute. 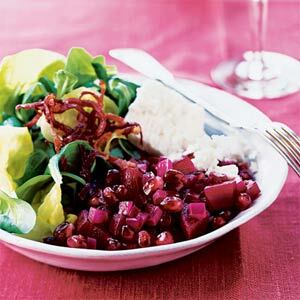 The beet and yam recipes are so simple you can easily add an additional flavour, such as an herb or spice, to reflect your own culinary tastes but try not to mask the flavour. Try to compliment it. Please note - all photos are stock photography, not actual pictures of the dishes I make. I have no idea where I found this recipe, but it's been a lifesaver! For my grown and extended family I have to make more - usually a recipe and a half (15 LARGE carrots) so you have to increase all ingredients by that amount. That usually will feed the 8-10 adults I have around the table with sometimes a little left over if you serve 2 vegetables. 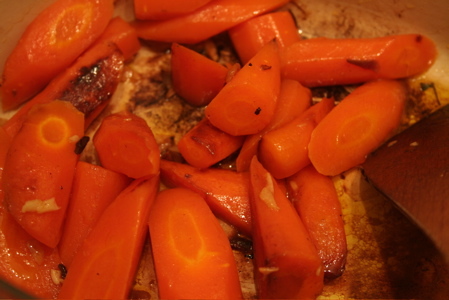 It initially looks like a lot, but even carrots get smaller when they are cooked, so be brave. Preheat oven to 375. Put butter on baking sheet with sides (for a recipe and a half you will need 2 that fit side by side in your oven) and place in oven until melted. Add carrots and stir to coat (another option is to put the carrots in a large bowl, melt the butter, pour over carrots, stir until evenly coated and then place them on the baking sheet). Sprinkle with Anise, Salt and Pepper and then drizzle with orange juice. Bake approximately 60 minutes turning at least once (the baking time really depends on how thick the carrots are and the size you cut them so keep a keen on on them). Remove from oven and transfer to a shallow baking dish to cool. Cover tightly with plastic wrap and refrigerate over night. The next day let stand at room temperature for one hour. You can then gently warm them in the microwave or re-heat uncovered in a 325 oven for 30 minutes. Be sure and stir once while warming. From the time I tasted my first pickled beet I have always loved them. I used to home-can my own. When we had a vegetable garden I began to enjoy the taste of the natural beet - sometimes called the vegetarian's steak. Now I love them just roasted with melted butter, salt and pepper so the taste really comes through. Here it is - easy and simple. Unfortunately, in this day and age we have lost touch with a few of these really healthy, flavourful choices and it can be a hard sell the first time out. Pre-heat oven to 350. Prick beets with fork and place in oven on foil lined cookie sheet. Roast until paring knife slides through easily. Cool, peel and dice (if you don't want red hands use kitchen gloves). Store in refrigerator in air-tight container. Bring to room temperature, add melted butter and season to taste with salt and pepper. Gently re-heat in the microwave. This is the easiest dish in my arsenal, but one of the more controversial ones as not everyones likes yams or sweet potatos. I think that's the reason that most recipes are full of marshmallows, brown sugar and butter. I personally prefer yams to sweet potatos. 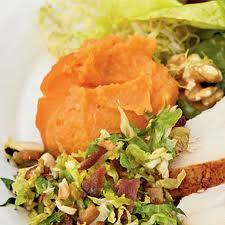 Yams have a rich orange colour that has plate appeal and more natural flavour than a sweet potato. My family has learned they are just part of our family's traditional dinner and while most have at least a taste, there are a few that don't. Yup that's it - so easy. Pre-heat the oven to 350. Wash and prick yams with fork. Place on a baking sheet lined with foil (easy clean up). Bake in oven until the natural sugars carmelize. What this means is that the juices are running out onto the foil and the yams are VERY soft. Cool and peel. Puree in a food processor in small batches with butter to taste (DO NOT OVER PROCESS - pulse just until smooth!). Season with salt and pepper and put in the refrigerator overnight. 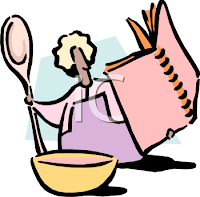 Let stand at room temperature for at least and hour and then gently re-heat in the microwave. I found this recipe on an internet search for a healthier version of this old Campbell's soup favourite I grew up with. Fortunately I printed it out as I can no longer find this specific link. It's fussier than the other recipes, but can be prepared the day before so that it takes no time on the day of your dinner. 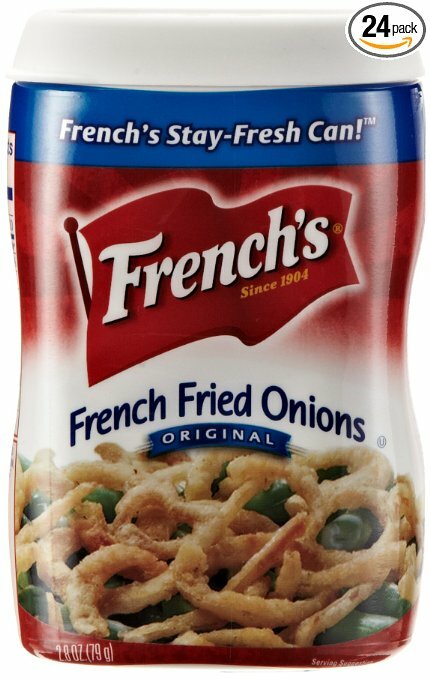 While the canned crispy onion rings are still there, all the other ingredients are fresh. The day before I make the mushroom sauce, blanch the green beans and process the fresh bread crumbs, then package up. It takes just a few minutes to assemble that day and pop in the oven. 1. Blanch the green beans in 4 quarts of salted boiling water until crisp tender. Drain and plunge into ice water to stop cooking. Spread beans on paper towel to fully dry. Store in air-tight container in refrigerator. 2. Make Sauce - Melt butter until foaming subsides. Add mushrooms and garlic and cook until mushrooms release moisture and the liquid evaporates - about 6 minutes. Add flour stirring constantly until well blended and then slowly add cream mixing well as you go. Simmer until sauce is thickedn and reduced to 3-1/2 cups - about 12 minutes - and then season with salt and pepper to taste. Cool and store in air tight container in refrigerator. Pre-heat oven to 425 degrees (watch this, I found it a bit high - top browns before casserole is hot). 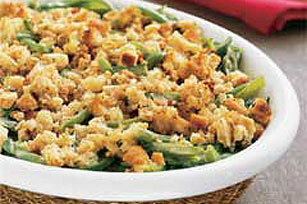 Add green beans to mushroom sauce, mix until evenly coated and then layer in a 9 x 13 inch baking dish. Mix topping ingredients and sprinkle over casserole. Bake until top is golden brown and sauce is bubbling around the edges (about 15 minutes). Serve immediately. Note - The only thing I noticed when turning this into a make-ahead dish is that if everything is cold from the refrigerator you might need to let it bake a bit to warm it before putting the topping on. The topping got brown before the casserole was steaming hot. If the family is coming to your house this holiday season, give yourself a break and do a few easy things so you have time to enjoy the company. The food will taste better if everyone is less stressed and you'll be happier you were the host if you actually get to enjoy the day.